at Warehouse 421, Abu Dhabi, 25th February 2017. Bayn: the In-Between considers the partition between the personae which dwell in our past, and our present incarnations which have experienced a succession of reconstructive events to arrive at a new place, with a reformulated identity. This transitive state of culture and identity, as well as the frontiers of our physical and ephemeral spaces, is an inclusive timeline bounded by the establishment of the UAE, and reaches forward into the country’s future as a self-determined, though as yet “unfinished” state. A cyclic separation, transition, and incorporation, aims to preserve cohesion amidst fluctuating, sometimes disparate parts of a social system, while affecting a transfiguration upon its traditional foundation. This transformation may be internal to the UAE, or within an individual, or it might be external, as with individuals who transplant from their base culture to be integrated into the Emirati culture. While experiencing their own internal, personal flux, inhabitants undertaking these relocations, will ultimately influence and occasionally fuel, the changes in their adopted cultural framework. Emerging Emerati curator Munira Al Sayegh, has assembled artists from the UAE, Iraq, Jordan, and Syria, who emulate this recursive process of self-critical examination and reintegration of new ideas, in the formation of their artwork. 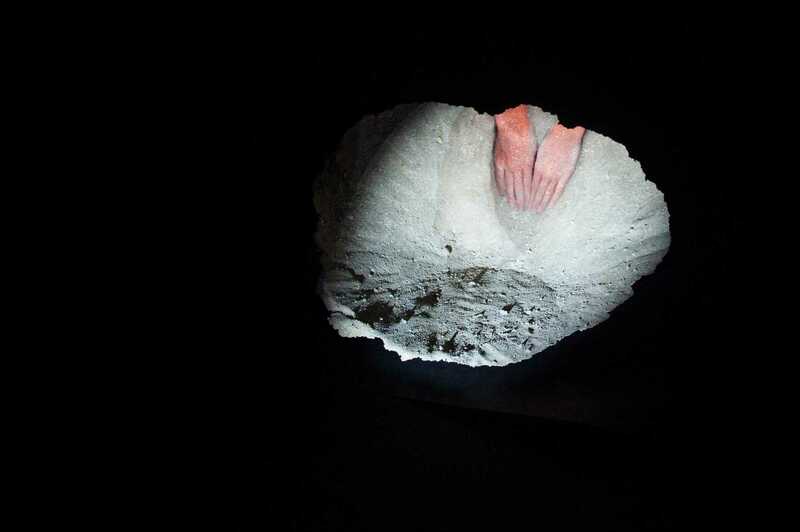 In collaborative exploration with Al Sayegh, artists across a broad spectrum of disciplines, investigate the physical and social landscape by employing a methodology which questions assigned boundaries and identities. The resulting matrices establishes a substantive, but undefined transitive space and occupy a fluid middle ground undergoing a perpetual reconfiguration. While remaining engaged in continual dialogue with an evolving, often paradoxical, culture, each artwork hold its own plot on a fluctuating landscape and echoes the thematic underpinning of the exhibition. Hatem Hatem’s Calcified Landscape adopts a synthesizing chemical process to create transient sea habitats. 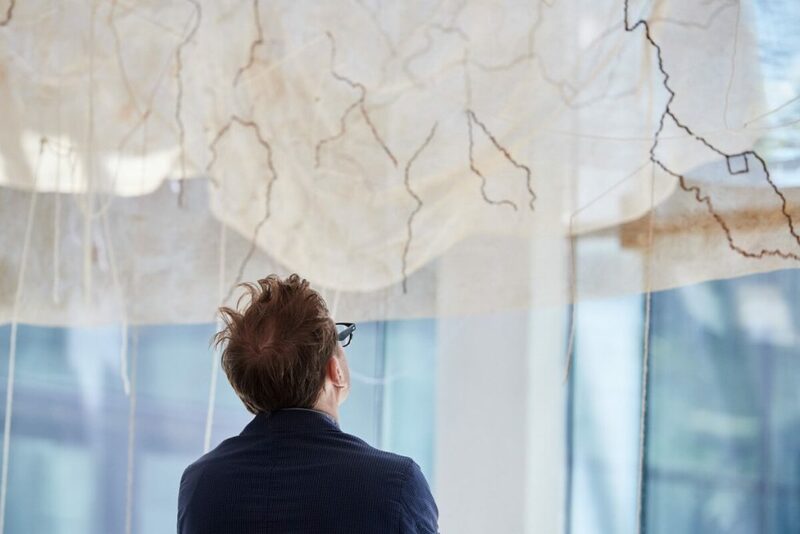 By forming salt composites through electrolysis, the artist “builds” artificial limestone formations as an armature for growing coral, which can then be used as a construction medium to support the traditional use of coral as a building material. This transitional process links the past to the future by maintaining the foundational use of these materials, while altering the method for obtaining them and minimizing the environmental impact of their utilization. 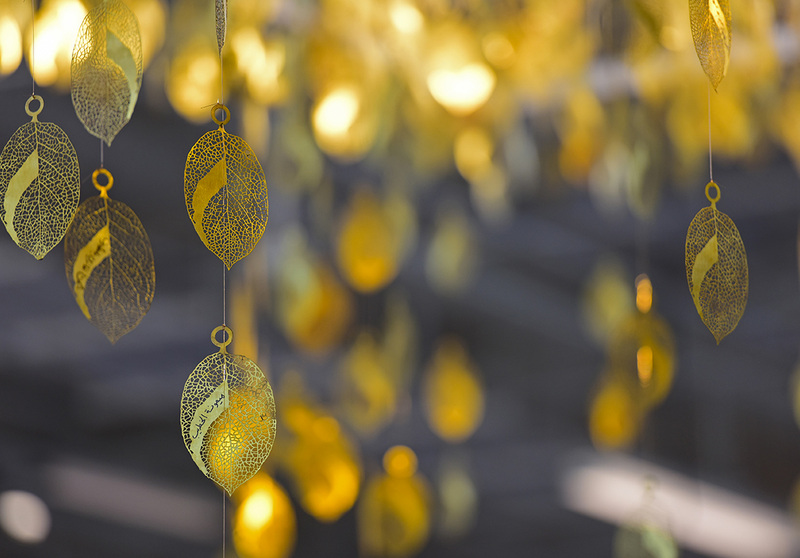 TREE OF GUARDIANS, a sculptural installation by Manila Al Dowayan, displays golden leaves inscribed with the names of women, placed next to a collection of “family trees.” The artist worked with Saudi Arabian women to trace their lineage in the same manner as their male relatives. Al Dowayan, redefines the present-day “in-between” by illuminating the omissions in the traditional approach of active forgetting, which has erased names and identities from the stories of the region. The juxtaposition of her creative elements counters the patriarchal system of historical documentation, thus highlighting women as a vital part of the present. In Geo Displacement, Asma Al Ahmed studies the disappearance of the mountainscapes in the northern and eastern part of the Emirates and their subsequent reappearance in construction materials used for building. Manipulating sheets of gridded mesh wire, Al Ahmed creates a large scale mountain-shaped sculpture and invites the viewer to walk through it. A projected image of the source materials taken from Ras Al Khaimah’s natural landscape, gives context to the work, and supports the theme of liminal transformation and reconstitution. The exhibition features work from Asma Al Ahmed, Hatem Hatem, Manal Al Dowayan, Maytha Al Shamsi, Nasser Al Zayani, Saif Mehaisen, Sara Al Haddad, Talal Al Ansari, and Talin Hazbar.